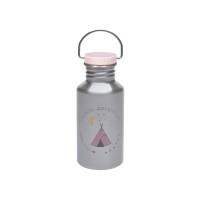 Product information "Bottle Stainless Steel, Adventure Tipi"
description & equipment For thirsty adventurers and world explorers: LÄSSIG’s robust stainless steel drinking bottle from the Children's Adventure Collection is unbreakable, leak-proof and is suitable for still beverages and cool drinks. The practical stainless steel bracket allows it to be carried or mounted easily. 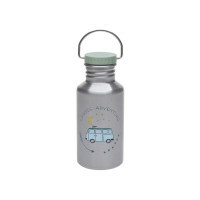 The trendy Adventure design of the Children’s Drinking Bottle, either in dusky pink with a tipi, or in blue with a bus, can be easily cleaned in the dishwasher.